Wonderfully massive palm tree trunk planters. Freestanding coconut palm trunks hollowed out and black-stained, retaining a great textured surface and thick outer walls. Impressive scale and great, undulating silhouette. Monumental and unusual botanical elements good for use indoors or out. 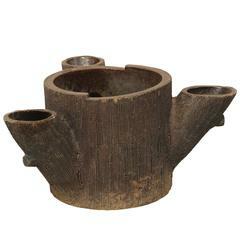 Faux Bois tree trunk planter. 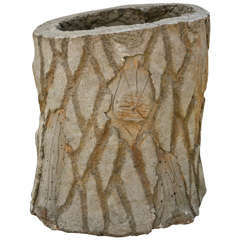 Ceramic faux bois tree trunk urn, planter, flower-vase or jardinière. 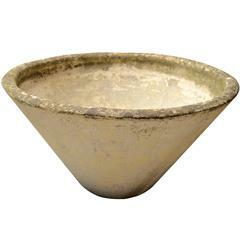 Massive garden planter, made in France, circa 1950. Original light blue paint with mossy patina. Massive tree pot by Swiss designer Willy Guhl for Eternit. Perfect for a large tree indoors or outside. Excellent patina. Over a 150 Willy Guhl pieces available in our other listings.